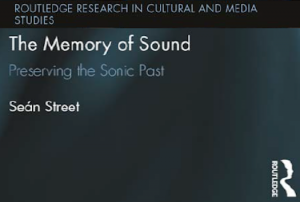 Seán Street's book, The Memory of Sound: Preserving the Sonic Past, was published in paperback on 1 June, 2016 by Routledge as part of its Research in Cultural and Media Studies series. This is an important book by a writer who understands the power of sound as a broadcaster, as a researcher, as a listener, and, above all, as a poet. Seán Street has already shown us in his earlier work, The Poetry of Radio – The Colour of Sound, how what we hear and how we hear it cuts to the heart of how we feel and how we understand – how we see. This book, in effect a sequel, examines, without jargon or heavy-handedness, the way that sound triggers and recalls memory, how, ‘given the right circumstances, the sound of the past can be caught by the memory like a photograph’. Drawing on his own life and experiences, and in conversation with specialists in key areas of research and practice, Seán Street, in 155 closely argued pages, brilliantly illuminates how sound, our first and last sense, runs like a flash of lightning through time lost and found. Sean Street manages to capture the invisible with words. This book is a beautiful and poetic investigation of the impact sounds have on us as we pass through our worlds, and their power when replayed again. Seán Street's The Memory of Sound is a moving and poetic book about the act of creating and preserving audio memories. While other worthy books might focus on the technical aspects of audio production, this carefully constructed work serves as a celebration of international documentary makers who have devoted their lives to recording the memories and stories of others. Street's profound insights weave through every chapter in this masterful work, each a cherished ode to the documentation and preservation of sound. For that I thank him.